Say goodbye to the stress of your wedding plan as you both explore the true beauty of ‘descending dragon’, Halong Bay. It has made its name to the international friends with its title as one of the new Seven Wonders of the world. 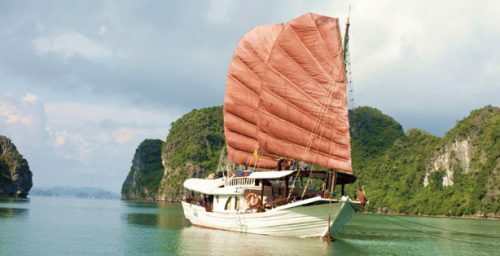 If you’re looking for a unique experience of escape, honeymoon in Halong Bay cruise is really a great start to feel the passion and show your love. Now read on my most favorite ideas for a romantic trip. Whether it has one or two cabins, the most intimate atmosphere is always there, right on the boat. If you prefer to stay in a private space in a limited size, pick cruise as if it’s your own paradise of love. You two can stand contemplating the starry sky from the deck by night and feel how this life is magnificent in a cozy light from overnight cruises. You will be welcomed drink, having a chance to pick out your favorite juice or red wine before taking a seat on chair to watch the beautiful sunset from distance. 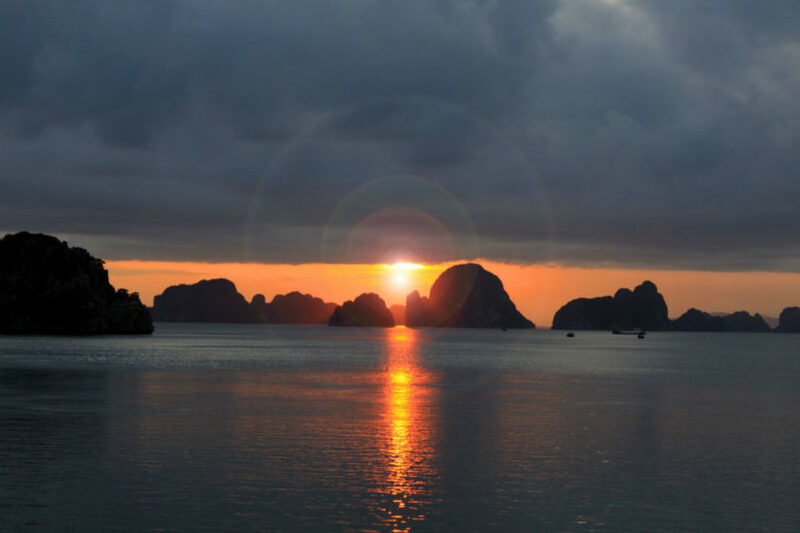 It’s undeniable that honeymoon in Halong Bay is truly amazing, especially when the sun starts to hide silently and then appear at once in the line of natural islets. The sun will slowly alter its color from yellow, orange to red and then get swallowed by the deep blue ocean. Yet, the fun has not stopped as the sun sets! After the delightful BBQ dinner with a great abundance of fresh seafood and fresh meat, a few sips of amazing cocktail or wine, let’s join a fun karaoke contest. It’s time to forget all the most fatigue times by cheering and singing together. 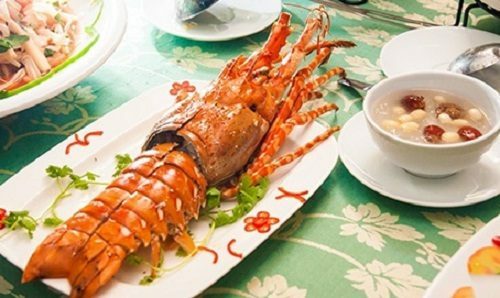 Having a dinner in cave is the highlight from your Halong Bay cruise, which gives you a totally different experience instead of eating on board. This is how you’ll get to enjoy a variety of fabulous local cuisine and immerse yourself in such an impressive ambiance. After spending a full day with swimming and getting around Halong Bay for sightseeing, you’re taken back to the cruise and relax on sundeck. After that, you both are led through the candle light to the position where your dinner table is set up. 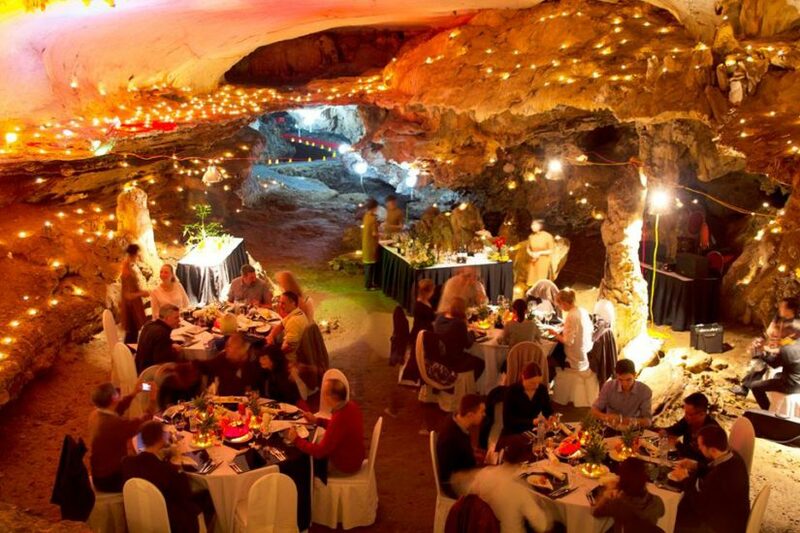 It’s in the cave, where food is still perfectly prepared to welcome you to a different world. It’s unnecessary to stick to the boat 24/24 since you can enjoy an open-air lunch date with your lover. 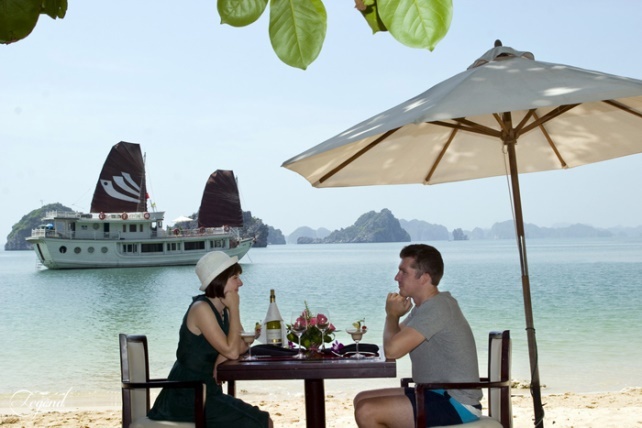 Halong Bay offers couples a chance to stop for a romantic meal on the beach where only two of you enjoy the breathtaking scene together. 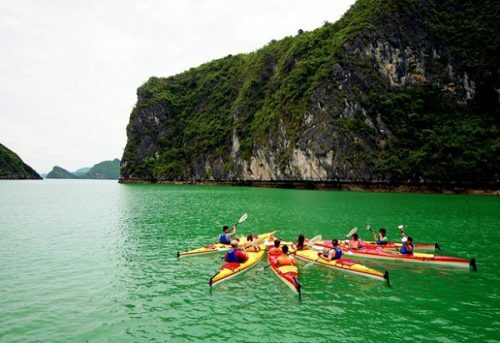 Don’t miss a chance to be surrounded by the fantastic view of Vietnamese beaches and limestone islands. If you like, let’s take a brief swim in the emerald sea and then sunbathe under the sunshine while the butler is preparing your table. Nothing is more wonderful than a memorable meal in nature, where you can enjoy alone with your partner for a self-retreat that’s worth your budget. Check out our suggestions above and pick the one you feel the best for yourself and your love. 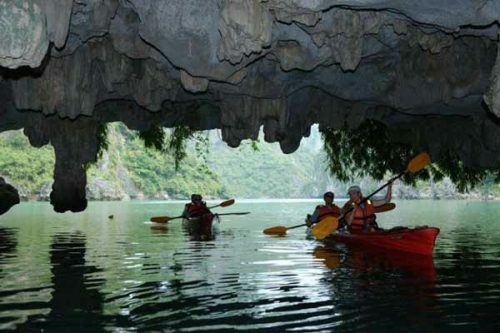 Let’s set up your own hideaway trip for an unforgettable honeymoon in Halong Bay and to start your happily after ever!